The recent deal regarding Iran’s nuclear program evoked lots of references to Prime Minister Neville Chamberlain negotiating with Hitler in 1938. 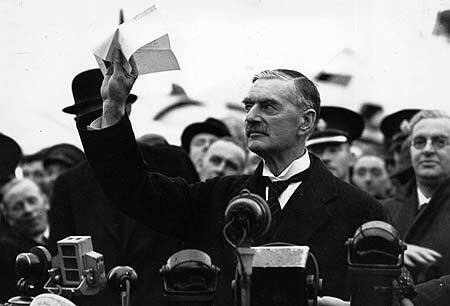 Chamberlain infamously came back from Munich, waved a “scrap of paper” and promised “peace for [not “in”] our time”. Germany immediately absorbed part of Czechoslovakia and eleven months later invaded Poland. How could Chamberlain have been such a fool? If only he had stood up to Hitler! Was he a coward? What happened in Munich was appeasement at its worst. As is often the case with famous or infamous historical events, the common view isn’t necessarily correct. Historians who suggest a new interpretation of the past are called “revisionists”. Sometimes they’re right, especially when their revisions are based on new evidence. … among historians, that view changed in the late 1950s, when the British government began making Chamberlain-era records available to researchers. “The result of this was the discovery of all sorts of factors that narrowed the options of the British government in general and narrowed the options of Neville Chamberlain in particular,” explains David Dutton, a British historian who wrote a recent biography of the prime minister. “The evidence was so overwhelming,” he says, that many historians came to believe that Chamberlain “couldn’t do anything other than what he did” at Munich. Over time, Dutton says, “the weight of the historiography began to shift to a much more sympathetic appreciation” of Chamberlain. The author suggests several reasons why, in his opinion, Chamberlain made the right decision: (1) most historians believe the British military wasn’t prepared for war with Germany in 1938; (2) Chamberlain’s military advisors told him that British forces couldn’t stop Germany from invading Czechoslovakia, but could eventually defeat Germany given time to prepare; (3) by 1938, Australia, New Zealand and Canada were no longer required to participate in a British war; (4) the Soviet Union was considered a potential enemy, not an ally; (5) America’s neutrality laws made it unlikely that America would join the fight; (6) although France was a likely major ally, British authorities had a very low opinion of France’s unstable government and the French military; (7) the British public, still traumatized by World War I, was strongly in favor of negotiation; (8) preserving the territorial integrity of Czechoslovakia wasn’t seen as justification for war, partly because Czechoslovakia had only existed for 20 years and many ethnic Germans in Czechoslovakia wanted to be part of a Germany; (9) the British generally believed that Hitler was similar to Mussolini, a fascist leader they knew, who was “more bravado than substance”. The Munich agreement between the United Kingdom, France, Germany and Italy was greeted in Britain as a success: “cheering crowds filled the streets and the press rejoiced”. The French reaction was similar. When Germany took more of Czechoslovakia six months later, however, Chamberlain realized that war was inevitable, increased the pace of British rearmament and instituted Britain’s first peacetime draft. Maybe Chamberlain and his supporters should have known better. After all, some of the British, as well as observers in other countries, correctly predicted that Hitler’s ultimate goal was the subjugation of Europe. We know the rest. The story we’re told about Munich is one about the futility and foolishness of searching for peace. In American political debates, the words “appeasement” and “Munich” are used to bludgeon those who argue against war. But every war is not World War II, and every dictator is not Hitler. Should we really fault Chamberlain for postponing a potentially disastrous fight that his military advisers cautioned against, his allies weren’t ready for, and his people didn’t support? At any rate, removing some economic sanctions in exchange for limits on Iran’s nuclear program isn’t the same as letting Hitler take part of Czechoslovakia in exchange for a promise of peace. By the way, the author of The Atheist’s Guide to Reality, the book I’ve been writing about recently, argues that we can learn nothing from history, since circumstances are always changing. In other words, history is bunk. But that’s consistent with his view that science is the only true path to knowledge. A more reasonable view is that there are recurring patterns in history, even if history doesn’t repeat itself. Looking back, it’s reasonable to conclude that negotiation is generally better than war.